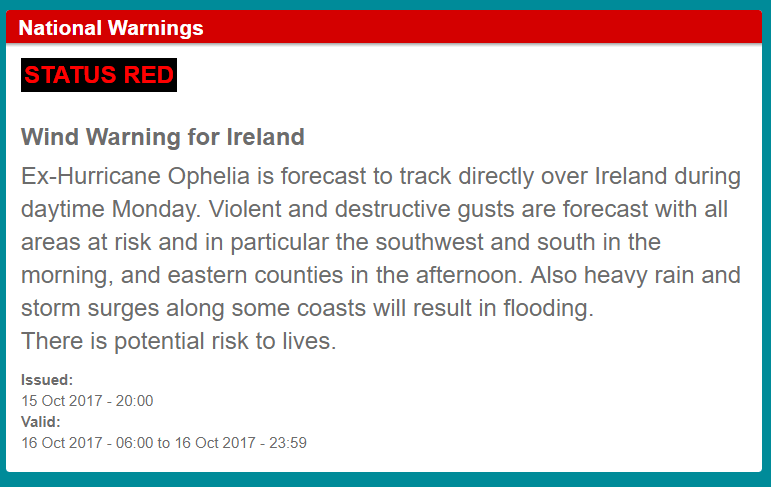 All of Ireland is under a red weather alert from 9am Monday as Hurricane Ophelia is expected to hit the country in the morning with wind gusts of up to 130-145 km/h expected. Authorities are warning that people should not make non-essential journeys, while hurricane experts recommend that people should stay indoors at the wind speeds expected. “In light of the revised warning An Garda Síochána wish to renew their appeal to all motorists and members of the public to not make any non-essential journeys. There should be no cycling and drivers of high sided vehicles and motorcyclists should also be aware of the extreme danger posed by gale force winds as they are particularly vulnerable,” said Tony Connaughton of the Garda press office. Danger is expected from the wind itself, objects caught in the wind, heavy rain, fallen trees, fallen power lines, and coastal swells. Thanks Cian, hope this storm passes through with minimal harm. One comment: Gardaí say no cycling but motorcyclists merely ‘should be aware’? Bizarre! Yes, crazy given that around 100km/h winds are expected in much of the country… and any non-emergency high-sided trucks driving around at high winds should be viewed as dangerous driving.